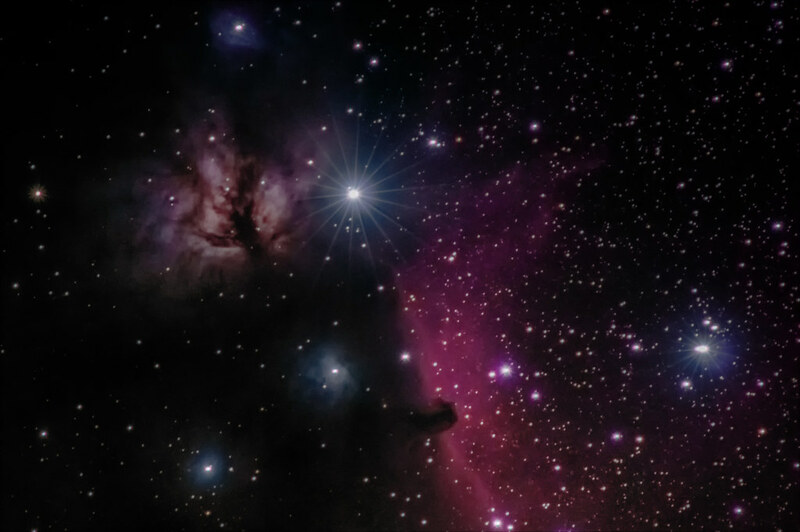 This is the Horsehead Nebula in the Orion region with the Horsehead Nebula, Flame Nebula and some other minor ones. Now the final result of test within a discussion in the Astrophotograpy Group that is about high iso, dynamic range and noise in astrophotos. It should prove that there is an enourmous potentional in Pentax cameras in respect to amateur astrophotography. Set up: K3 II with SMC Pentax-A 400 mm F1:5.6 @F1:6.3, 88 x ISO 400,15 x ISO 1600 and 91 x ISO 3200, 60 seconds exposure az ISO 400 and 1600, 30 s aat ISO 3200. Stacking with DeepSkyStacker with 2x drizzle activated. The Picture is uncropped. Postprocessing with Photoshop and Lightroom, some denoising with NIK dfine2. Think I'll just stick to my "simple" street photography, I don't need a dictionary to do that. Well...some of us are sitting in the bushes for hours getting perforated by moskitos just to wait for some birds to come close enough for a portrait. Others wait freezing in the dark night collecting photons and tons of pictures to stack them in the rest of the weekend. Others have >24000 posts and a "harem" of personalized lenses they carry around. I think we all are sharing the same drug and who wants to decide where passion ends and mania beginns? ......and since when is good street photograpy "simple"? In answer to your question... in my case that'll be the taxman. It's a doddle compared to all that techy stuff your doing to those stunning images. This will be coming up again soon! Yeah and I canˋt wait for the nights to get longer! Same, but I need the clouds to go away too! I will be taking some baby steps when the clouds clear, hopefully around the 9th Sept. Fingers crossed. Thank you, Kevin! I have my fingers crossed..